In an overstuffed San Luis Obispo Superior Court hearing that has played out over three days and counting, a small army of lawyers has traded motions, objections, and quips back and forth—all for the purpose of determining the strength of the case against five Cal Poly student athletes charged with carrying out an August 2014 armed robbery. As the court closed for the day on Jan. 14, cross-examination was still ongoing. Though the afternoon of Jan. 15 seems a likely concluding date—it's still unknown precisely when the hearing will wrap up. SLO Superior Court Judge Donald G. Umhofer is still set to rule whether there's sufficient evidence for the case to move to trial as the hearing stretches into its fourth day. 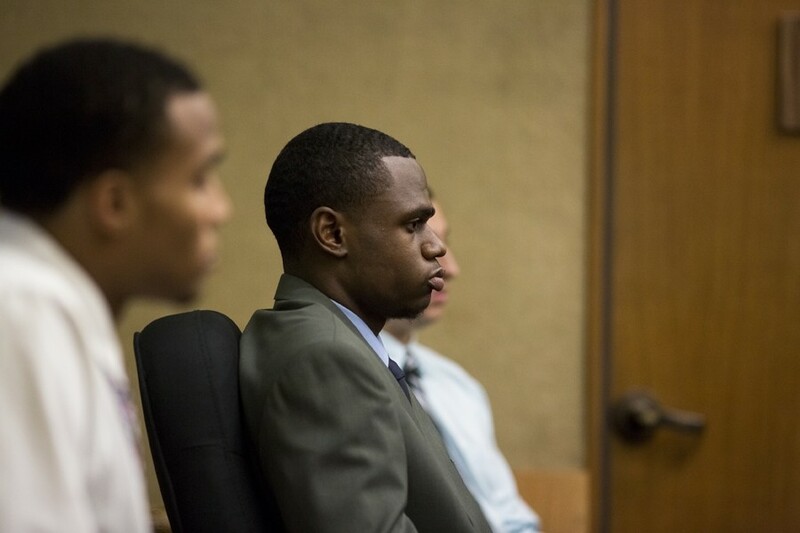 DAY(S) IN COURT: Defendants (from left to right) Dominique Love, Cortland Fort, and Jake Brito, as well as Kristaan Ivory (not pictured), began their preliminary hearing in SLO Superior Court on Jan. 12. The hearing is expected to conclude on the afternoon of Jan. 15, at which time the presiding judge will decide if the case will move to trial. To recap: Cal Poly students and football players Cameron Akins, Cortland Fort, Dominique Love, Jake Brito, and Kristaan Ivory were arrested on Aug. 10 on suspicion of planning or carrying out an armed robbery at the off-campus Delta Sigma Phi fraternity house. All five defendants have been charged by the SLO County District Attorney’s office with multiple felony counts of robbery, burglary, and false imprisonment by violence, and all have pleaded not guilty. Akins was also charged with three felony counts of resisting arrest. All of the students remain indefinitely suspended from the football team, but all except Fort are still enrolled at Cal Poly. The preliminary hearing for four of the five defendants began Jan. 12. Akins waived his right to such a hearing, essentially conceding probable cause. During a preliminary hearing, the defense and prosecution both get to vet the assembled evidence, and the presiding judge determines whether there’s enough evidence to require a formal trial. From the outset, the attorneys for the defendants set out to undermine and question the evidence against their clients. The testimony of two SLOPD detectives who investigated the case—Eric Vitale and Amy Chastain—revealed many details about how the five student athletes came to be charged. In the wake of the incident, Chastain and Vitale interviewed all of the five defendants, as well as many fraternity brothers and a handful of non-fraternity witnesses to the incident. Chastain claimed that Ivory said he wasn’t making any money during the summer and football offseason and didn’t like asking his parents for money. Ultimately, though, Chastain said Ivory claimed he had backed out of the robbery at the last second with Brito—though he saw police cars upon leaving the scene. Upon being told that Akins had been arrested at the scene with a gun in his possession, Chastain claimed that Brito was shocked there had been a weapon involved. “He said I was a liar and began to physically shake and cry,” Chastain testified. New Times plans on covering the hearing until it concludes. Check back on this article, our Facebook page, and our home page for breaking news updates and additional content.